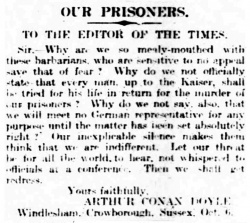 Our Prisoners is a letter written by Arthur Conan Doyle first published in The Times on 8 october 1918. Sir, — Why are we so mealy-mouthed with these barbarians, who are sensitive to no appeal save that of fear? Why do we not officially state that every man, up to the Kaiser, shall be tried for his life in return for the murder of our prisoners ? Why do we not say, also, that we will meet no German representative for any purpose until the matter has been set absolutely right? Our inexplicable silence makes them think that we are indifferent. Let our threat be for all the world, to hear, not whispered to officials at a conference. Then we shall get redress. Windlesham, Crowborough, Sussex, Oct. 6.